Is Channel Islands National Marine Sanctuary in jeopardy? Ventura County supervisors oppose infringing on marine protected area. VENTURA ― The Ventura County Board of Supervisors unanimously approved submitting a letter on July 25 to the federal government opposing intrusion on the Channel Islands National Marine Sanctuary. U.S. Department of Commerce has been tasked with reviewing 11 national marine sanctuaries designated or expanded in the last 10 years. The analysis could have an effect on marine sanctuaries if potential offshore energy resources are found. Channel Islands National Marine Sanctuary is one of the 11 marine sanctuaries subject to review. 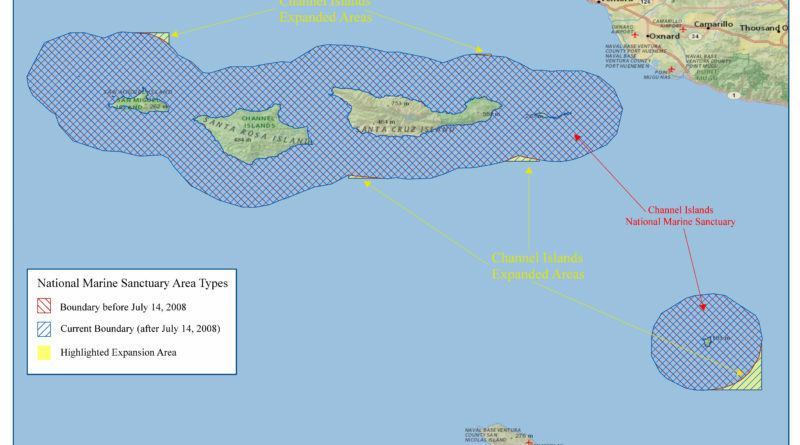 Oil and gas drilling are currently prohibited in marine sanctuaries. Is this local marine protected area (as well as the other 10 national marine sanctuaries) in danger of offshore oil drilling? A discussion with a definitive response came down to the wire when the county’s supervisors agreed to send the letter addressed to the U.S. Secretary of Commerce Wilbur Ross. The letter states the board’s opposition to impeding on the Channel Islands National Marine Sanctuary. The original deadline to submit comments was July 26. “In the 45 years the National Marine Sanctuary program has been in existence, no President has ever reduced or eliminated a National Marine Sanctuary,” Bennett’s recommendation continued. President Donald J. Trump issued an executive order referred to as an “America-First Offshore Energy Strategy” on April 28, which commands Ross to bar any further expansion of marine sanctuaries and review the current national marine sanctuaries. “America must put the energy needs of American families and businesses first and continue implementing a plan that ensures energy security and economic vitality for decades to come,” the executive order states. “The Secretary of Commerce shall… refrain from designating or expanding any National Marine Sanctuary under the National Marine Sanctuaries Act,” the executive order continued. Environmental organizations, coastal residents and Channel Island visitors expressed their support verbally and in writing for the Board of Supervisors to send a letter opposing offshore oil activity and reducing the size of the marine sanctuary. Jim Hines, representing the Sierra Club’s support in Supervisor Bennett’s motion to send a letter to the government, stood at the podium and spoke to the Board of Supervisors. “I had several meetings with the gentleman who actually issued the oil drilling permits should the sanctuary be reduced or eliminated altogether,” Hines said. “Secretary of Interior Ryan Zinke has said to me and others that his goal is to remove all the protections of the Channel Islands National Marine Sanctuary, a sanctuary that draws thousands of visitors from around the world and scientists who study the natural resources of this rich biological region,” Hines continued. Supervisor Linda Parks expressed her appreciation for Hines’ advocacy on behalf of the Sierra Club and going to Washington D.C. The Board of Supervisor heard from Ventura County residents, Channel Island Naturalists and Restoration volunteers, a regional manager for the Surfrider Foundation, a Nature Conservancy ecologist and even children expressing the importance of preserving the Channel Islands and protecting the marine sanctuary. The United States Congress recognized the islands off the Ventura County Coast in 1980 as the Channel Islands National Park. At the same time, the six miles of water surrounding the Channel Islands National Park were designated as the Channel Islands Marine Sanctuary. The deadline to submit public comments has been extended to Aug. 14. The public can add comments to the Federal Register online at bit.ly/2t5oMTy.